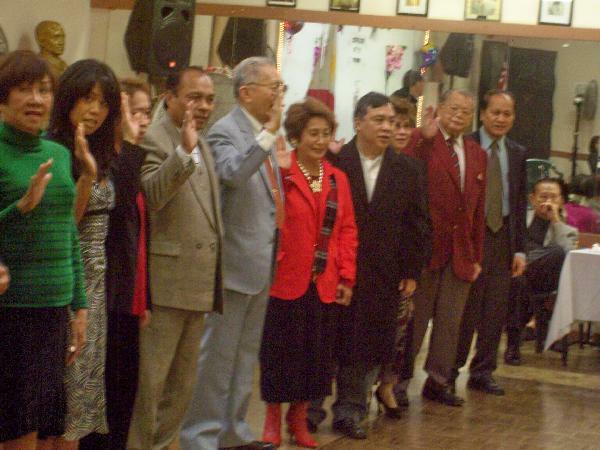 The new FACLA Board for 2009-2011 led by the new FACLA president Rizalino Manuel of Filipino American Community of Los Angeles (FACLA) was sworned –in to office last Sunday,January 4. 2009 at FACLA Community Hall. Attended by more than a hundred guests and FACLA members,sworned in as new executive officers were Rizalino Manuel, President;Adolfino Aguayon -1st Vice Pesident; Terry Herrera as 2nd Vice President; Gloria Resureccion as 3rd Vice President; Darlene Salvador as Secretary; Cris Florendo as Treasurer and Romy Jaravata as Auditor. 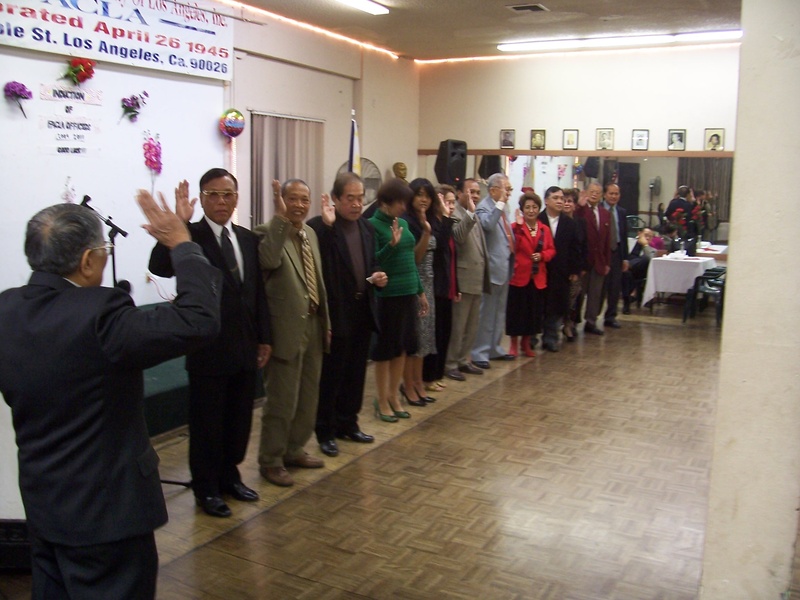 Los Angeles- The new FACLA Board for 2009-2011 led by the new FACLA president Rizalino Manuel of Filipino American Community of Los Angeles (FACLA) was sworned –in to office last Sunday,January 4. 2009 at FACLA Community Hall. Attended by more than a hundred guests and FACLA members,sworned in as new executive officers were Rizalino Manuel, President;Adolfino Aguayon -1st Vice Pesident; Terry Herrera as 2nd Vice President; Gloria Resureccion as 3rd Vice President; Darlene Salvador as Secretary; Cris Florendo as Treasurer and Romy Jaravata as Auditor. The rest of the board received chairmanship of different committees. They were Alice Parino, Arturo Garcia, Senen Dela Torre, Teresita Eligino, Perfecto Tobias and Ricky Songalia. FACLA’s President Dr. Jose Baldonado for the last six years since 2001 gave his valedictory address as he transferred the gavel of leadership to the new president. “ It is not true that FACLA did nothing under my leadership. First, we improved the parking lot that cost $ 13,000 dollars, and then we changed the roof, the dance floor and then this smooth transition of power. This is the truth, we did some good things. "” Baldonado explained. The coming president Rizalino Manuel said; “ FACLA is the first and the oldest non-profit community organization in Los Angeles. But does everybody know that FACLA has been mired into legal cases and intrigues since 1997 ? That FACLA has two presidents at one time? That FACLA lost its properties? I knew it because I was here since 1992." Former COMELEC Commissioner Honorio Cabanilla swore in the new officers in the absence of Deputy Consul Daniel Espiritu who did not make it to the affair. Former FACLA treasurer Sally Jamorambon acted as the emcee. Dancing and revelry followed after the formal program was closed by Mr. Aguayon.